LED By LITE: Taking Orders! BikeCommuters.com > Commute > LED By LITE: Taking Orders! Just got word from LED By LITE that they are taking orders for their cool light system. 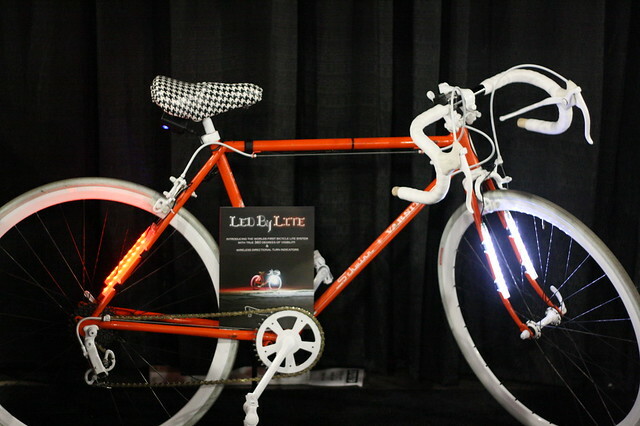 We first introduced you to LED by LITE at Interbike. Their products created such a buzz with bike commuters everywhere. Well the great news is, you can get a set for your bike! Here’s the email I received from Brandon Smith, President. We recognize you as a leader in the Bicycle community and want to let you be one of the first to know about our new 360 degree light system going for 30% off at KickStarter. We’re specializing in top of the line bicycle illumination with our patented design. It is strong enough to not be affected by a down pour of rain and can withstand the weight of a 4,000 lbs vehicle driving over it. Our 30% off sale starts October 14th – November 28th, through our Kickstarter website. To all those who have been watching and waiting for a Lite System, pre-order yours now through Kickstarter. Be a part of the See & Be Seen community and support LED By LITE. Feel Free to forward along this link and spread the word. I watched the video at LED by LITE’s website. The lights are much brighter than I expected. The rears, especially. If I rode a simple, unencumbered bike, like a fixed gear, I would be all over these. Unfortunately, mounting the rear lights on the seatstays means panniers would obscure them. I wonder if some sort of hook could be included, so the lights could be hung from the blinkie straps lots of panniers have? A long strip of LEDs would certainly get the attention of motorists. I assume they are 1/2 watt LEDs. The video clip mentions these lights are “see and be seen”. It’s difficult to tell just how much forward projection the front light provides. Since they’re just LEDs mounted with no sort of reflector behind them, I imagine they don’t project much. Someone riding in a city with streetlights will do just fine with these. People who ride in poorly lighted conditions would seemingly need a more powerful light in addition to these. But, hey, more lighting is always better. Neat product! I’m sure the company will find a market for it. It may not be stereotypical bike commuters who have to haul a bunch of stuff in their panniers, but I’ll bet kids on fixed gears in cities will like this a whole lot. i think id rather get the portland design lights like the radbot. Agreed – expensive. But I love the concept. What I’d really like to know is how impossible it would be to have lights like this installed in the bicycle itself, instead of an add-on feature? We don’t strap lights to our cars and LEDs are so light now, only the wieniest of weight-wienies would even notice… battery or generator, with these things standard on all bicycles I think that everyone would win. I love this idea… but you have to pledge $150 or more to get the handlebar turn-signal deal, which to me is the entire point of the whole operation! Without the turn signal bit, what’s the difference between this system and doing this? While I love the idea and the look of the system like the others I have to question the price. I concur with the link Matt referenced. It might not be as pretty, but with a quick trip to (insert auto parts store here) I can have a full front and rear system up and running for ~ $45* switches, batteries, the whole shebang. Thanks for that link, Matt. Sounds like I might have picked up a neat little project this weekend! I checked out the exact lights referenced in the link Matt gave at my local auto place today and I have to say I was less than impressed. They weren’t that much brighter than the LED status lights on my USB hub or my speakers.